In an era where social media outlets such as Twitter and Instagram push photojournalists to publish sooner and faster with editing tools in the palm of their hand, accessible almost anywhere and any time, any discussion of the ethical standards of photojournalists has to include the boundaries of digital manipulation, everything from cropping to adding/removing people from a scene. While most discussion about the ethics of digital photojournalism centers around digital manipulation tools such as Adobe Photoshop, manipulation of photographic images goes back to the earliest days of photojournalism. When its photographers were barred from taking pictures of a sensational courtroom drama in 1924, the Evening Graphic decided to piece together a photographic representation in the darkroom. Using 20 different images, the Evening Graphic’s art director created a composite picture that depicted what the scene might have looked like. He called his creation a “composograph,” and the image ran on the newspaper’s front page. The public reaction was immediate. Though the publication of the image as documentary news coverage of the event would be considered ethically heinous by journalists today, readers loved it. Circulation soared from about 60,000 to several hundred thousand readers (Kobre, 1995). As the profession grew in the first half of the 20th Century, so did ethical standards. Representative statements — for example: “Be accurate and comprehensive in the representation of subjects,” “While photographing subjects, do not intentionally contribute to, alter, or seek to alter or influence events,” and “Editing should maintain the integrity of the photographic images’ content and context” — became part of the National Press Photographers Association Code of Ethics when that association was formed in 1946. Some studies such as University of South Florida researcher Edgar Shaohua Huang (2001) report on reader’s perceptions of digital manipulation, have examined readers’ attitudes/perceptions. He found that readers are concerned that “once editors start making alterations, it is hard for anyone to know where they will draw the line” and that readers are much less accepting of alterations of hard news photographs. Readers said they believed documentary photos should not be altered. One respondent said, “I would like to be able to pick up a newspaper or magazine or whatever, and know what I am looking at really is what took place at that point.” But he also made five other conclusions based on his survey: Readers should know if an image was altered; media outlets need to consider context when using an altered image; alterations should be kept to a technical minimum; media professionals should put themselves in the subject’s shoes to see how they would feel about an altered picture of themselves; and, finally, media should consider moral-ethical guidelines and not be guided by what is strictly legal. The media industry polices itself and Huang’s study was published in 2001. Yet, less than two years later, digital manipulation of a spot news image, this time an image transmitted via satellite from the battlefield, again made the national news. While on the Iraqi battlefield with British soldiers, Los Angeles Times photographer Brian Walski acknowledged that he used his computer to combine elements of two photographs, taken moments apart, to improve the composition. In a statement issued days after the front-page publication of the spot news image, editors published a statement that read, in part, “Times policy forbids altering the content of news photographs. Because of the violation, Walski, a Times photographer since 1998, has been dismissed from the staff” (Editor’s Note, 2003). Later Walski, now a commercial and wedding photographer in Colorado, said, “I f—ed up, and now no one will touch me. I went from the front line for the greatest newspaper in the world, and now I have nothing. No cameras, no car, nothing” (Irby, 2003). Two years after that incident, the North Carolina Professional Photographers Association rescinded awards given to Charlotte Observer photojournalist Patrick Schneider after board members determined that he removed background information from certain images — including some spot news images — through excessive adjustments in Adobe Photoshop. Charlotte Observer editors fired Schneider in July of 2006 (Marion, 2008). The policy at the Charlotte Observer was clear. In 2008, Editor Rick Thames said, “We have an established policy on this issue, and it really comes down to the fact that journalism cannot be about original art forms, unless it’s labeled as such” (Defoore, 2008). Despite the outcry of leaders in the profession as well as working photojournalists, the credibility of even the world’s top photojournalists comes into question the minute someone makes an allegation of digital over-manipulation. In 2013, the World Press Photo of the Year by Paul Hansen of Dagens Nyheter, a photograph of two dead children being carried by extended family members after an Israeli missile strike came under scrutiny after allegations of over-manipulation and compositing of multiple images. After a “forensic analysis” of the image, World Press Photo determined, “It is clear that the published photo was retouched with respect to both global and local color and tone. Beyond this, however, we find no evidence of significant photo manipulation or compositing” (World Press Photo, 2013). What photographer Michael Okoniewski (1987) said still rings true today. “We are probably going to debate this question of digital imaging for a long time. But then again, we’ve been playing with our photos for a long time also.” And after the discussion of Hansen’s winning image, World Press Photo stated, “Only retouching which conforms to currently accepted standards in the industry is allowed.” What those “currently accepted standards” are remains open for discussion. Two research questions evolved from the historical imperatives of what photojournalists say regarding how much they can manipulate images after-the-fact. DIGITAL ETHICS: How far is too far when it comes to the digital manipulation of graphic, spot news images? ETHICAL CODES: What wording within a code of ethics would give photojournalists guidance regarding any manipulation of graphic, spot news images? This research used a 36-question survey partially built upon existing studies of professional photojournalists focusing on their ethical standards in spot news situations and digital manipulation of hard news images. The link to the SurveyMonkey survey was distributed on multiple email distribution lists using social media, including outlets of College Media Association, Journalism Education Association, Radio Television News Directors Association and National Press Photographers Association. After establishing standards by showing respondents well-documented, digitally manipulated images, respondents were shown published images from the Boston Marathon, some digitally manipulated by various news outlets, to determine whether a standard for the publication of digitally altered graphic images in a world where images can be published from the field with little or no intervention by editors and asked what standards should be used before publishing the graphic images and what level of manipulation they would allow. In total, 829 people, including 283 professionals, 51 college photojournalists and 57 college media advisers/instructors. Of them, 63 percent were male, and more than 40 percent of all respondents had more than 20 years experience. Nearly 40 percent described themselves as primarily working for newspapers, and more than 25 percent described themselves as primarily working for online media. Magazine photojournalists represented nearly 20 percent of the sample. The lede on the Page 1 story by Mark Arsenault of The Boston Globe described the situation on April 15, 2013. “Two bomb blasts, 12 seconds apart, rocked the finish line of the 117th running of the Boston Marathon Monday, killing at least three people, including an 8-year-old Dorchester boy, wounding more than 130 and leaving sidewalks of Boylston Street covered in blood.” The tally of injured would later be upgraded to more than 250, and the coverage by The Boston Globe won that paper a Pulitzer Prize a year later. Discussion of the images published in papers and on websites around the world, similar to those published from previous terrorist attacks, school shootings, war zones or suicides, fostered discussion about whether publications should have published the images, how they should have been published and what level of digital manipulation, from cropping to blurring of faces, was acceptable in this spot news situation. One of the most controversial images was one of runner Jeff Bauman, both of his legs blown off by the blast, being carried away in a wheelchair. The image was published in various forms on dozens of websites, social media outlets and in newspapers worldwide. Follow-up coverage of Bauman won photographer Josh Haner and The New York Times a Pulitzer Prize. Yet about 15 minutes after posting the image of Bauman unaltered, editors at theatlantic.com chose to blur the face of the victim (fig. 1). When evaluating this posting, college students/instructors and professionals disagreed about whether the blurring technique was acceptable. While 36 percent of professionals agreed with the decision to run the image with Bauman’s face blurred, 49 percent of college students/instructors said it was acceptable, a statistically significant difference (p<0.01) of 14 percent. College students/instructors were more tolerant of blatant digital manipulation — manipulation that was clear to the viewer — even though a higher percentage (67 percent) later in the survey indicated such manipulation is acceptable, but it “should be obviously false to the reader” and 94 percent of college students said, “Any manipulations should simply include routine cropping, color correction … or dodging/burning to improve reproduction quality.” Blurring Bauman’s face was obviously false but did not meet the other criteria, criteria the vast majority of college students said they accept in principle — if not in actuality. The difference between the college-level respondents became even more striking when considering only college students, not instructors/advisers. Of the 51 students responding, 71 percent said it was acceptable to run the image with Bauman’s face blurred. “Credit to The Atlantic for trying to respect his privacy,” said one college student responding. “I had to think about this one a little more,” said another. “I’m really on the fence about this … because it’s self-evident that face was intentionally blurred. We understand it was an editorial decision, however misguided. (Why not blur ALL the faces? ),” said another. Editors too discussed the publication of the image of Bauman, defending their choice of whether to publish or how to publish the image. 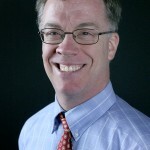 Bob Cohn, digital editor for The Atlantic, said his staff chose to publish an original photograph over a cropped version other outlets published because it seemed more authentic (Haughney, 2013). However, the website stated, “(Note: An earlier version of this gallery featured this photo with the graphic warning but without the image blurred. We have since decided to blur the subject’s face out of respect for privacy. )” One respondent said, “Run it without alteration or not at all. This was a public event, and nobody, including the victims, had a reasonable expectation of privacy.” Of the 651 total comments on this question, 163 (25 percent) mentioned privacy in their response. The significant difference between college students/instructors and professionals, however, did not continue to the more subtle digital manipulation of an image of woman in a pool of blood with broken bones in her legs visible. When the New York Daily News published Tlumacki’s image, the News (fig. 2) digitally manipulated the image so the broken bones were no longer visible. “The Daily News edited that photo out of sensitivity to the victims, the families and the survivors,” spokesperson Ken Frydman said. Cover of the Daily News, Tuesday, April 16, 2013. “There were far more gory photos that the paper chose not to run. Frankly I think the rest of the media should have been as sensitive as the Daily News” (Pompeo, 2013). Of professionals, only 18 percent deemed the manipulation — the alteration of reality — acceptable. Similarly, 19 percent of college students/instructors deemed the manipulation acceptable. Again, more college students, found it acceptable to run the altered version of the image even though in this case, the alteration was not noticeable to the viewer. Fewer students found this manipulation went too far than did professionals. While only 40 percent of professional photographers said they had a company policy that would limit the amount of alteration in an image, even fewer college students/instructors — 17 percent — indicated they had such a policy. College students/instructors did not agree with the professionals about what should be in such a policy if they did have one. Respondents looked at three statements and were asked if they accepted them as a statement of principle. Accurate representation is the benchmark of our profession. We believe photojournalistic guidelines for fair and accurate reporting should be the criteria for judging what may be done electronically to a photograph. Altering the editorial content … is a breach of the ethical standards recognized by the NPPA. Altered images should be obviously false to the reader. The professionals did find these phrases acceptable. Differing from the professionals significantly (p<0.05), the college students/instructors did not. However, the effect size of the difference was only 5 percent on the first statement — the fundamental NPPA statement of principle created in 1991. On the second and third principles, college students and professionals disagreed that these are acceptable principles as worded. The greatest difference (10.3 percent) was on the third statement, which 73 percent of college students/instructors (and 67 percent of college students alone) accepted as a statement of principle, allowing publication of obviously false images while 83 percent of professionals thought this was an acceptable statement of principle. Still, the professionals and college students/instructors agreed on three other statements. Any manipulations should simply include routine cropping, color correction to restore the color balance to what appeared in the actual scene or dodging/burning to improve reproduction quality. Readers should know that an image was altered. The highest and strictest standards should be applied to hard-news photographs. A holistic examination of the results of the survey in the context of prior research leads to two items worth discussion. First, it is necessary to develop a credible ethical standard for digital manipulation in the college media newsroom before an event occurs that tests the standards of the photojournalist trying to be both first and accurate. 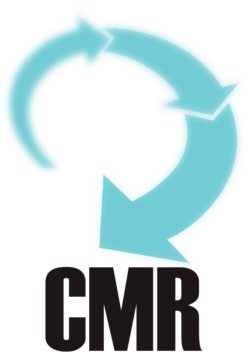 Second, the discussion should include development of a code of ethics delineating what the staff believes is acceptable regarding the digital manipulation of images and under what circumstances will any manipulation be allowed. The next generation of cameras and current tools such as Eye-Fi allow for nearly instantaneous publication of photographs from high-end digital cameras. Software such as iPhoto allow iPad and iPhone users to paint adjustments onto an image with a finger or to add photo effects with a tap whether roadside covering a car wreck or sitting in Starbucks drinking a latte. The editor as a gatekeeper may no longer be a part of the process. Continuing education, planning and discussion of when it is acceptable to take photos and to publish photos and how much digital manipulation will be tolerated is warranted for anyone armed with a camera — which means everyone in the newsroom. Whether it was a discussion of the content of an image and whether it should be published based on community standards, as one photographer said, “We should not be allowed to ‘bend the truth’ without telling the public exactly what we did” (Brink, 1988). No single code of ethics or policy can dictate what is right or wrong in any situation. Photojournalists, who continue to be passionate about their need to document the realities, and sometimes the horrors, of the human condition, need to be made aware of community standards through discussion of events such as the visual coverage of the 2013 Boston Marathon, the expectations placed upon them and the need to be held accountable to those standards. As Vincent LaForet said, “What really differentiates us from other photographers and media is our credibility. We have a history of getting it right, accurately…. Our credibility is all that we have” (Irby, 2003). When split seconds matter, as technology evolves and the decision making moves into the hands of street photographers, not sheltered editors, credibility and conscience have to remain at the fore of the process. In terms of general ethical standards regarding the publication of graphic, spot news images, college photojournalists and professionals agreed that it is acceptable to document reality without “softening the blow.” They agreed that the highest standards should be applied to spot news images. However, they did not always agree when it came to the digital manipulation of such images, possibly getting confused by what determined what is “obviously false.” One-third of professionals deemed such manipulation of a spot news image acceptable, turning it into, by some definitions, a photo illustration despite its use in a news context. Spot news images should not be considered photo illustrations and, as respondents to the survey and an abundance of previous studies indicate, should remain unaltered in the context of documenting historical events. Despite confusion in the exact wording of acceptable phrases for a code of ethics, it seems that setting guidelines for the manipulation of spot news images is exactly what is warranted at college media outlets where students come from a great variety of backgrounds, many without any journalistic experience. “You can’t set ethical guidelines. Ethics, like morals and standards, are personal. Everybody has his or her own. Fine. Except for one small catch: Journalists serve the public. If we aren’t perceived as credible, we can’t be of much service. Ethics are more than a personal matter in photojournalism because what we do affects a large number of people” (Brink, 1988). The research validated many of the common statements used in codes of ethics pointing toward more exploration of items such as making manipulation “obviously false” to the reader/viewer, guidelines that college media can use when developing policy and when training staff members although the phrase “obviously false” may warrant use of examples and refinement. Staffs may adapt guidelines delineated in the NPPA Code of Ethics reminding photojournalists to be honest, based on the first statement in the code: “Be accurate and comprehensive in the representation of subjects.” Brink elaborates, “The majority of students tended to list honesty as the best guidelines for ethics…. While specific ethics changes from profession to profession, their foundation does not. The foundation is basic, simple honesty, the kind you learn in kindergarten: Don’t tell us stories about things that didn’t happen. Don’t show us things that don’t exist” (Brink, 1988). One of the limitations of this research began with the survey, a survey that focused on one spot news event, the 2013 Boston Marathon. It is always difficult to generalize findings based on discussion of a single event. 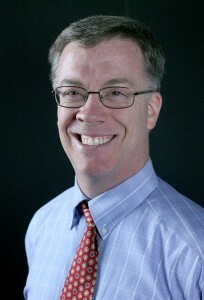 While general questions in the survey regarding ethical statements of principle attempted to get at larger issues and to provide college media advisers with specific statements they could include in their own codes of ethics, they were still tested in the context of a specific event, possibly limiting the generalization of the findings. As with any study using correlation, it is difficult to interpret causation. However, given the differences between college photojournalists and media advisers and between college photojournalists and professional photojournalists, one area for potential future research is longitudinal. Where do college photojournalists learn their ethical principles regarding digital manipulation? Findings may examine the validity of teaching ethics formally in the classroom or whether ethical principles are formed before students reach college. Additional research might examine whether those students whose ethical principles do not match the accepted norms of the professional simply enter other careers. Or we may discover that ethical principles are evolving along with the technology and what might have been deemed unacceptable 30 years ago is now accepted practice under certain circumstances. In addition, research may examine when ethical principles are taught in a college or university setting. Are ethical principles taught in conjunction with a course on digital photography and Adobe Photoshop or taught independently? Do students make connections between what is journalistically acceptable (what they should do) and what is technologically feasible (what they can do)? Are designers and reporters taught the same guidelines for those times when they are the only one, or the first one, on a spot news scene with a camera? While college and professional photojournalists generally agreed with the hard line drawn on any manipulation of hard news images but sometimes disagreed when discussing specific images from the 2013 Boston Marathon, the implications of what constitutes “obviously false” and when a photo moves from being a documentary image to being a photo illustration still merit further study. Online, theatlantic.com ran the image with Jeff Bauman’s face blurred. Was this acceptable? The Huffington Post published the unaltered image by John Tlumacki of The Boston Globe. 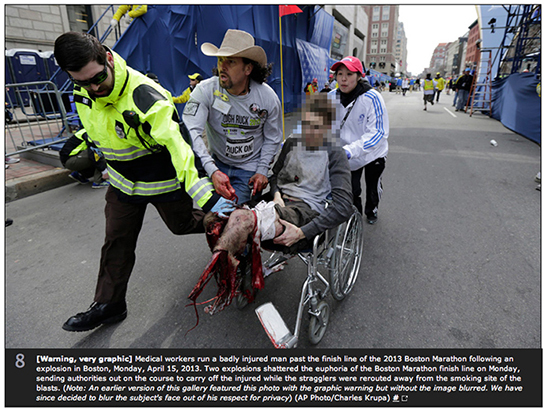 In print, the New York Daily News ran an altered version of the image the leg injury on the left removed. Was this acceptable? Barrett, Bill. (1999, Sept.). Policy for the Ethical Use of Photographs. Retrieved online from http://www2.webster.edu/~barrettb/journal_ethics.htm. Defoore, Jay. (2008, Dec. 19) “Newspaper Photog Fired for Altering Photo — Again.” Retrieved online from http://www.popphoto.com/photos/2008/12/newspaper-photog-fired-altering-photo-again?page=full, Aug. 13, 2013. “Editor’s Note.” (2003, April) Los Angeles Times. Retrieved from http://articles.latimes.com/2003/apr/02/news/war-1walski2 May 19, 2013. Haughney, Christine. (2013, April 17). “News Media Weight Use of Photos of Carnage.” The New York Times. Retrieved online from http://www.nytimes.com/2013/04/18/business/media/news-media-weigh-use-of-photos-of-carnage.html?_r=0 Aug. 13, 2013. Huang, Edgar Shaohua. (2001, September). “Readers’ Perceptions of Digital Alteration in Photojournalism.” Journalism and Communication Monographs. 3(3), 147-182. Kobre, Ken. (1995). “The Long Tradition of Doctoring Photos.” Visual Communication Quarterly 2(2), 14-15. Marion, Monte. (2008, Nov. 25) Patrick Schneider: Where Is the Line? Retrieved online from http://txstatejournalismethics.blogspot.com/2008/11/patrick-schneider-where-is-line.html Aug. 13, 2013. National Press Photographers Association. (1991). “Statement of Principle.” Retrieved online from https://nppa.org/page/5167 May 19, 2013. Okoniewski, Michael. (1987, August). “Hands of God.” Letter published in News Photographer, 64. Pompeo, Joe. (2013, April 17). 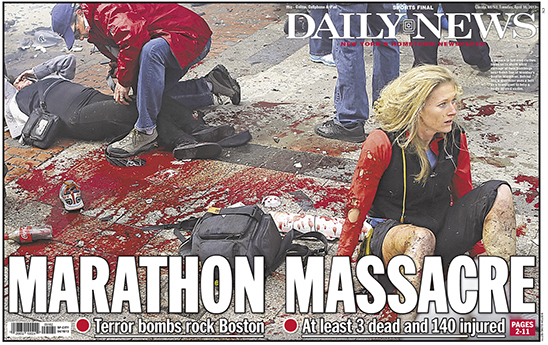 “Daily News doctored front-page photo from Boston bombing.” Retrieved online from http://www.capitalnewyork.com/article/media/2013/04/8529102/daily-news-doctored-front-page-photo-boston-bombing. Wheeler, Tom and Tim Gleason. (1995, winter). “Photography or Photofiction: An Ethical Protocol for the Digital Age.” Visual Communication Quarterly. 2(1), 8-12. World Press Photo. (2013, May 14). “Digital Photography Experts Confirm the Integrity of Paul Hansen’s Image Files.” Retrieved online from http://www.worldpressphoto.org/news/digital-photography-experts-confirm-integrity-paul-hansen-image-files May 20, 2013.